Hello every body I'm new to the board, live in california, I own a couple of ab, red nose, ground pounders, Im here to learn, and meet more ab family/friends. Re: new to the board..
welcome and thank you for joining. Paula Rivera is from Cali. You guys did a dog show before right? Your name sounds familiar. 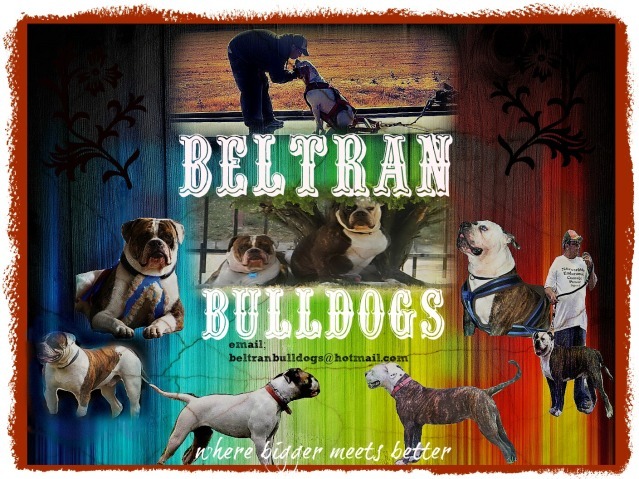 You have other breeds, not just american bulldogs? SusanG wrote: Paula Rivera is from Cali. You guys did a dog show before right? Your name sounds familiar. You have other breeds, not just american bulldogs? we attented the north cal show, in addition to that we had a very large get together a couple of weeks ago, preparing for a dog show.. and yes only ab, but my brother did alot of pit pullsa and german shepherds backin the day. Its still in the talking stages, but will be after the vegas show..
bulldozer bullies wrote: Its still in the talking stages, but will be after the vegas show..
thank you..for such a nice banner...also we will keep every body posted on the dog show events time, day, location.. like i said its still in the talking stages..more details to come.. would love to meet all you guys..
bulldozer bullies wrote: thank you..for such a nice banner...also we will keep every body posted on the dog show events time, day, location.. like i said its still in the talking stages..more details to come.. would love to meet all you guys..
Wassup, what part of Cali you at??? I'm in West Sac!!!! maddog wrote: Wassup, what part of Cali you at??? I'm in West Sac!!!! Its a pleasure chating with you and we also would love to meet you in person.